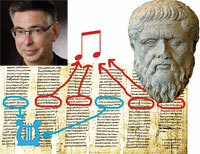 Ahistorian claims to have cracked a mathematical musical code in the works of Plato. Jay Kennedy of Manchester University said it was “like opening a tomb”. The historian of science found many of Plato’s dialogues had line lengths based on multiples of 1,200. Kennedy says this pattern corresponds to the 12-note musical scale used by Pythagoreans. He divided the texts into equal 12ths and found that “significant concepts and narrative turns” are at the junctures. Andrew Barker, an authority on ancient Greek music, said it also explains why Aristotle claimed Plato was a follower of Pythagoras, to the bafflement of most scholars.